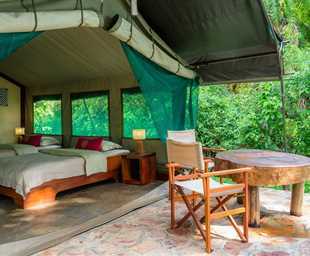 Akagera National Park is located in the north east of Rwanda along the border with Tanzania. Although founded in 1934, much of the park was re-allocated as farms and in 1997 the park was reduced in size from more than 2,500 sq km (nearly 10% of the surface area of Rwanda) to its current extent of 1,122 sq km. 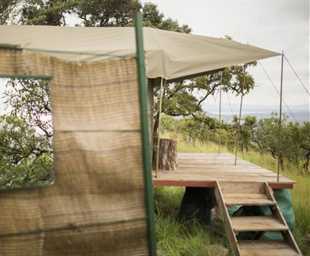 Since 2010, a joint venture with African Parks has seen Akagera return to its former glories. It is named after the Akagera River that flows along its eastern boundary and feeds into a labyrinth of lakes of which the largest is Lake Ihema. The forest fringed lakes, papyrus swamps, savannah plains and rolling highlands combine to make Akagera amongst the most scenic of reserves anywhere in Africa. It has exceptional levels of biodiversity and forms the largest protected wetland in central Africa. Akagera combines well with Nyungwe and the Volcanoes NP to offer a great safari element as it is home to many large plains game species as well as species restricted to the papyrus swamps such as the Sitatunga and the sought-after Shoebill Stork. Notable plains game include elephant, buffalo, topi, zebra, waterbuck, roan antelope and eland. Other antelope are duiker, oribi, bohor reedbuck, klipspringer, bushbuck and impala. Of the primates, olive baboons, vervets and the secretive blue monkey are seen during the day, with bushbabies often seen on night drives. Due to its wide variety of habitats, Akagera is an important ornithological site with nearly 500 bird species. The rare and elusive shoebill shares the papyrus with other rarities such as the exquisite papyrus gonolek and countless other water birds that inhabit the wetlands in large numbers.